A single color LED has one color only. The color of the light is usually reflected in the color of the plastic housing, but not always. 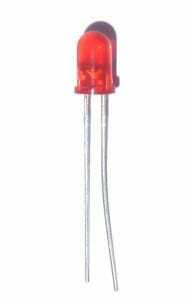 It has a cathode and an anode, and it is powered by connecting the positive voltage terminal to the anode and the negative to the cathode. An LED should always have a current limiting resistor. The most common single-color LEDs are: Infrared, red, orange, yellow, green, blue, white. These LED types come in multiple colors in the same housing. For example red and green to show the status of something. They have more than two terminals so that you can choose among different colors. Recently, more and more RGB LEDs are found. These are LEDs containing red, green and blue color. By switching among these very fast, it is possible to make all the colors in the spectrum. These are the most standard LEDs. They usually have a voltage drop of about two volts and a forward current of about 10-20 mA. The light intensity is not that high, so these are usually used for indicating something and not for actually illuminating a space. These LEDs are used for creating more light than the low-power ones. They are made with more metal so that they are able to dissipate more heat. High-power LEDs are used for creating light bulbs or for other light-intense applications.